A pair of Shanghai - Hong Kong high speed trains are running daily. They finish the distance of 1,930 km (1,200 mi) with the travel time of 8 - 8.5 hours. A second class seat ticket costs CNY 1,008. In addition, a pair of traditional style through trains are available every other day with the travel time of 19.5 hours. Passengers should go to Shanghai Hongqiao Railway Station and Hong Kong West Kowloon Railway Station to take these bullet trains. Note: The timetable above is for reference only. Please search for the real-time schedule via the search box on page top. The through trains run between Hung Hom Station and Shanghai Railway Station every other day. The entire journey of 1,991km (1,237 mi) takes about 19.5 hours. Although the ticket price is only CNY 477 for a hard sleeper, much cheaper than bullet trains, it is not recommended for the looong travel time. 2. The train departs from Hong Kong every other day. 3. "+" indicates the second day. You can buy the ticket with your valid passport either in Shanghai or Hong Kong; or for your convenience, from a travel agency who offers train ticket booking service, like TravelChinaGuide. 1. No Spring Festival and summer holiday (Jul.15 – Aug.31) peak season discount. 2. Children under 5 years old travel for free but have to share beds with their parents; those between 5 and 9 years old are on 65% children’s fare; children older than 10 years old are on full fare. They have no seasonal discounts, but are eligible for group discounts. Up to 60 days advance tickets are sold in Hong Kong’s Intercity Through Train Customer Service Center at East Rail Line Hung Hom Station or at other ticket offices and agents in Hong Kong. However, the tickets for deluxe soft sleeper from Shanghai to Hong Kong are sold only in Shanghai. TravelChinaGuide provides railway ticket booking service for most classes of Z99 and Z100, except the soft sleepers of Z99, which can only be purchased by passengers themselves at Shanghai Railway Station. Passengers should get to the Entry and Exit Hall of Shanghai Railway Station early for the exit processing as early as 90 minutes before scheduled departure. The boarding gates are closed 15 minutes before scheduled departure. In Hong Kong, customs check begins 45 minutes in advance, and the boarding gates are closed 10 minutes before the train leaves. Ticket change and refund are available at the station where tickets were purchased. The tickets for the train to Shanghai should be changed at least 30 minutes before departure time, while tickets for the train to Hong Kong should be changed 2 days before departure date. Ticket refund should be done at least two hours before departure for the train to Shanghai, and 2 days before departure for the train heading to Hong Kong. A service charge of 20% of the ticket price will be charged for ticket refund. For tickets booking via agencies, the refund and changing policies may be different. You may contact that agency for the details. Thanks a lot for your message and for your help with our train tickets. Everything went well. As soon as we checked in our hotel in Shanghai the concierge gave us our train tickets. The train ride was wonderful and very comfortable. We will write something on your website. Thank you very much for all your help. Everything worked fine, thank you! I travel a lot. The best experience ever. The service is great, the system works well very professional. I got in touch with you because I needed to book traintickets. A collegue who has been to China last year, told me about your website and gave me all the details. Booking a trainticket was so easy. It is also very helpfull the website gives the different possibilities when there is no direct train between two cities. But maybe you can mention that you need at least 2 houres between trains especially if you have to change station. In Europe it is no problem to change trains if you have only 20 minutes. I was only very worried about the arrival of the tickets. They were send to our hotel. But they were there when we arrived. I've made inquieries by live chat and by sending an email and I am satisfied by the reaction on both occasions. I was a bit worried about taking the train but everything went very well. Everything is mentioned very clearly. Even my children, who hardly speak Chinese, could see where we had to wait. Most of the people of the train were very friendly. During one trip we used a meal on the train. This was very good. We are very happy with your service. We are satisfied with the overall procedure. I am very pleased about purchasing tickets on line. The process was easy. 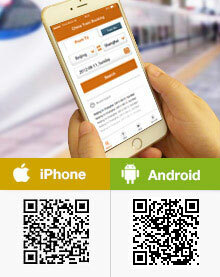 In addition, it is easy to get the ticket or change schedule as well. I was also surprised that the consultant responded my purchase and questions promptly. I definitely will travel by the high speed train more often then by air in China. Everything worked like clockwork. The tickets were waiting for me at the hotel when I checked in and everything went smoothly at the station. It was easy to find the right train and the right seat. I am coming back to China with more travel group and we will be taking the same train journey from Shanghai to HK. In view of your excellent service, we will be using Travel Guide China again. Is 1 hour enough to collect ticket and finish the Customs in Hongqiao Station? In fact it would be better if you can be there a little earlier, but not due to the customs but ticket collection. During holiday time, the station could be extremely crowded so you may face a long queue for ticket collection. If possible, maybe 1.5 hours would be better. The customs only occurs after your arrival in HK, not in Shanghai. If 3 pieces of luggage in total for 3 passengers, it should be fine. You can take them with you into the carriage directly without extra fee. If the luggage size is too larger, it may questioned by the station. But the detailed cost is not clear. Hello, if I book the ticket online, where can I collect the tickets? In HK? Can both of them be get together in HK before my departure date? Yes, there is a ticket office on B1 floor in the West Kowloon Station where you can collect the tickets for all trips. You can inform us this collection request in our booking form. We will arrange it based on your request. Thank for your inquiry. My wife and I want to go to Shanghai from Hong Kong about March 17. Can we stay 3 days without a Visa? We are on a cruise to Hong Kong and would like to visit Shanghai. Is there a first class or sleeper? How much is round trip? We are US citizens. If we left on 17th would we have to return on 19 or 20? We are a little flexible on dates. Could leave 17, 18, or 19. From HK to Shanghai, there is high speed ride available. The ticket price is CNY1,646.5 per ticket for first class seat, one way. I am planning from Hongkong to tinghai by high speed train how do I do any suggestion? Thanks. Is the spelling of "tinghai" is correct? Which province does "tinghai" belong? If your trip is after Sep 23, you can take a high speed ride from HK to Hangzhou. Then you can change to a long distance bus to Zhoushan Dingdai.